Wait — is that a giraffish mane on the sauropod??? Heavens! 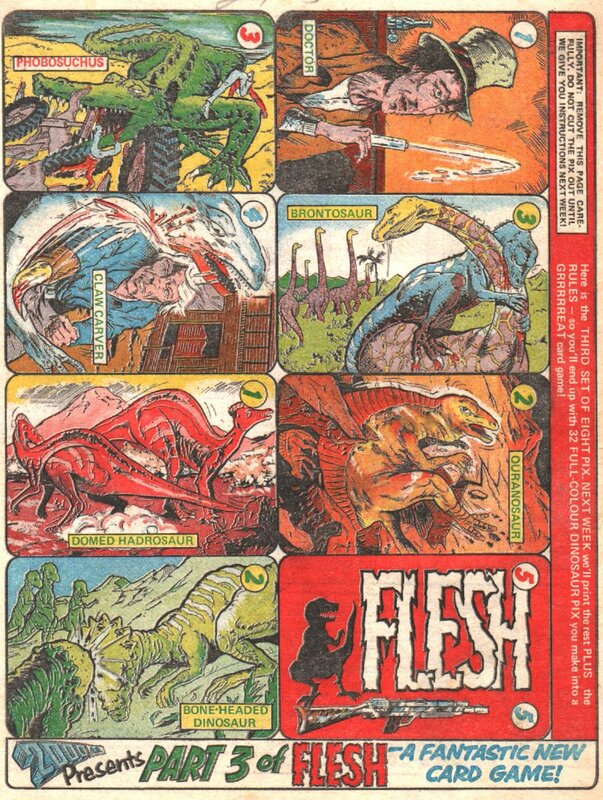 My faith in the absolute originality of comic book dinosaur illustrations is shattered! But I now have faith that no matter how trivial or old, no mashup “plagiarism” will go unnoticed. “Ascent of Man” plagiarists, I’m lookin’ a YOU! Plagiarised, derivative, inspired by, tip-of-the-hat, homage – it’s all a matter of perspective! You’re going to find that many of the truths we cling to depend greatly on our own point of view. Except that, no, this is pretty much a straight-up ripoff. 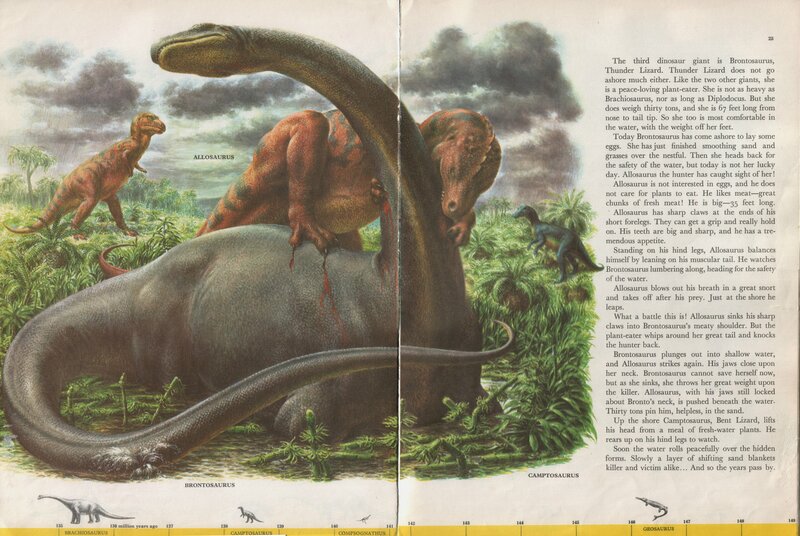 I do like how the 2000AD Allosaurus has its hands around the sauropod’s neck, as if it is giving it a hug. A terminal hug, but still. It does resemble Knight’s Brontosaurus somewhat — but not as closely as it resembles another classic piece of palaeo-art. 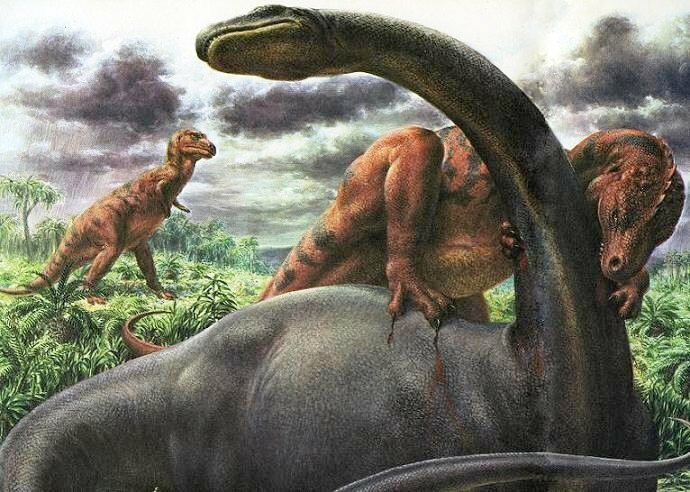 Sauropod-neck-biting scenes always remind me of p30-31 in the first dinosaur book I owned (one of several books published the year I was born that I always owned and never shared with older sibs; a good system! 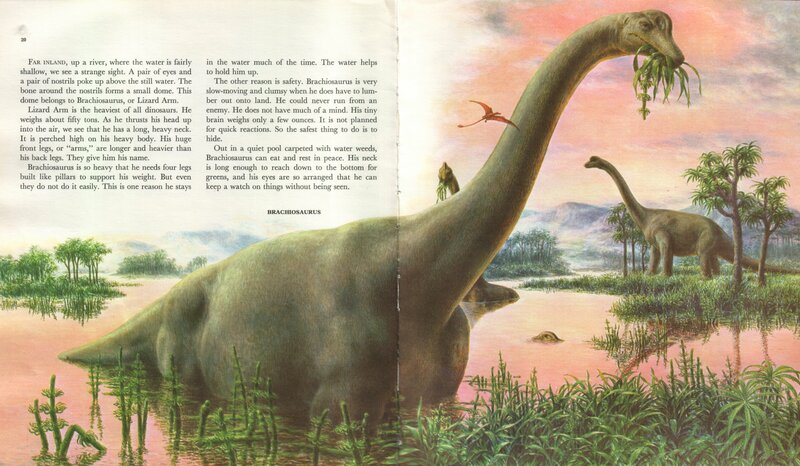 ), the Collins/Nugget Dinosaurs of the Earth (1964). The artist on that book (Sol Korby) blatantly ripped off Knight, Zallinger and others, and had some problems with geometry and perspective, but for the first half of my life that was what dinosaurs looked like. Korby’s theft of the scenes shown above spreads over pages 28-31, but only the actual neck-bite is shown here. But damn, that was a quick fix. Yes, I too grew up on Dinosaurs of the Earth. I was delighted a couple of years ago when my sister found a second-hand copy somewhere and gave it to me. I well remember the neck-biting scene you mention. At least it was better than The How and Why Wonder Book of Dinosaurs. I started with “So Long Ago” by E Boyd Smith, which covers not just dinosaurs but the whole history of metazoa. Why did those dinosaurs have such long necks? Answer – so they could spot the Allosaurs from a long way off. The higher your eyes, the further you can see. Yes I suppose you could debate whether this was “plagiarized.” Ummm what do you call it when you scan a copyrighted book and reproduce it on your blog, I wonder? I would call it copyright violation, but exceptions exist in copyright law for the purposes of critique. Note that Plagiarism is nothing to do with copyright.